Travel Trailer Vs Tent Trailer: Why I Picked A Hard-Side Trailer! I just recently purchased a conventional travel trailer (hard side) and I faced the agonizing choice of whether to pick a tent trailer or a regular travel trailer. I also considered some hard side travel trailers that had canvas pop-outs, which are sometimes referred to as hybrid trailers. 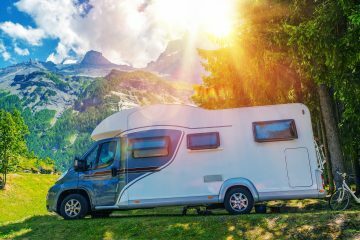 In general, I recommend a travel trailer if you won’t have problems towing and storing the trailer and have a larger budget. If you need something easier to tow, store, and don’t mind losing storage space and a bathroom, then a tent trailer is a great option as well. Anyway, in the end I decided to go with a conventional travel trailer, so I thought I’d share some of the things that I considered and benefits/drawbacks of both options. When you’re in a conventional travel trailer, it’s basically like being inside your home. It can rain cats and dogs outside (where does that expression come from? It’s weird) and you’ll stay perfectly dry. But a good tent trailer will also keep you dry, just that sometimes the walls “persperate” which can bring some condensation indoors. This is especially true near the beds where some of the bedding can get wet when it touches the sides. It’s not a big deal, but it does mean you may have to air things out after a night of camping in the rain if you’re in a tent trailer. One negative to a traditional hardside travel trailer is that they can tend to feel like you’ve spent all weekend in a tiny apartment, instead of feeling like you had a relaxing and peaceful camp out in the woods. We wondered about this, but in the end we decided it wouldn’t be a problem because we spend most of our time sitting out by the campfire anyway, and really only go inside during the hot part of the day to cool off and and at night to sleep. My brother suggested that those who feel this way about traditional trailers should consider a hybrid traditional trailer that has canvas popouts. A tent trailer can weigh 2,500 pounds when a comparable traditional trailer would weigh 4,500 pounds. For those who don’t have a big heavy truck to tow a heavy camper, a tent trailer is an excellent option. Tent trailers not only weigh less because they have canvas sides, but also because they usually don’t have nearly the amount of wood cupboards or other amenities. 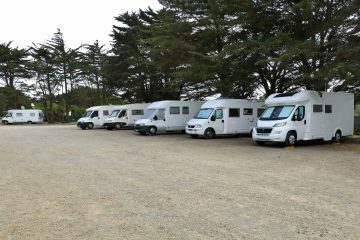 For our family, one of the biggest benefits of a camper trailer is that we can take all of our gear, food, bedding and other supplies and leave them in the trailer. When we want to go camping, each of us grab a change of clothes, we get a jug of milk, and put it in the trailer and we’re ready to go. On a Friday after the kids get out of school, we can be totally ready to camp in less than 30 minutes. Before we got our trailer, it would take us several hours to pack the car to get ready for camping, and we hated coming home from camping because we had an hour of work to do to clean out the car. Traditional trailers often have four times more storage than tent trailers inside, and even more outside. Also, it’s much easier to get in and out of a traditional trailer to load/unload because you don’t have to pop it up. For our family, this was the #1 draw to a traditional trailer. Most tent trailers even fit in a garage, which is nice to keep it from the elements. A tent trailer will often cost $10,000 less than a traditional trailer when purchased new. That’s a huge amount of money, so be sure you have a good reason to pick a travel trailer when you could save a lot of money. Not only are tent trailers less expensive to buy, they are also significantly less money to insure because they have fewer things inside to break, and they will save you a lot of money on fuel in towing them. I wouldn’t say this one is always true. There are some tent trailers that have a nice large space; however, I’d say generally travel trailers have much more room. 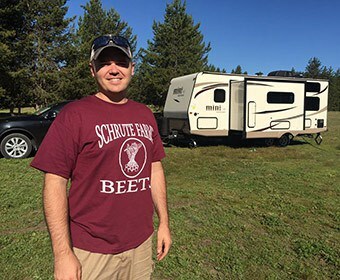 I read several forum threads of people who own tent trailers before making my decision, and the number one complaint I heard from many tent trailer owners was that they were too cramped–especially for a family. One nice thing about travel trailers is there are hard walls in the interior that offer much more privacy. The tent trailers that do actually have a bathroom (and not all do), are often just giving you a toilet with a curtain around it. Not exactly fun to poop in front of the whole family. Because you can see over a tent trailer when collapsed, it is much easier to back up, tow, and move around. The tough thing about backing up a trailer is that you can’t really see behind you, so a tent trailer claims this as a nice benefit. Then again, you can always get a backup camera on your traditional trailer, which obviates this benefit. One benefit of a traditional trailer is that when you arrive at the camp ground, you’re done. Maybe set up the stabilizers if you don’t want the trailer rocking around, and that’s really it. A pop up takes a bit more time to pull out the bed pop outs and support them, crank up the top, set up the kitchen, etc. Pop-ups sometimes have bathrooms that put you behind a curtain, but more often than not, you’re pooping behind a curtain. But the more common scenario is that you’re left squatting in the woods if you have a tent trailer. My family didn’t really care about the bathroom so much, but for some people, this is a major consideration. Not having a bathroom, however, means that you don’t have a black tank to empty. That’s nice! If you’re camping with a spouse or others who don’t really enjoy camping, they’ll probably enjoy a travel trailer much more. Since it feels like you’re inside, you feel protected from storms, bears (beets, battlestar gallactica… ha ha), and the cold. Many camping grounds do not allow unattended pets to be left in pop up trailers for fear that they could easily get out or they could stay in there and bark all day long and drive people crazy. So if you plan to stay at a lot of paid camping areas, at least check the restrictions if you have pets. 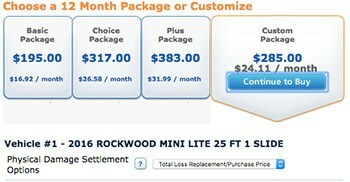 How Much Does Travel Trailer Insurance Cost? Yes, I agree with you that hard walls in the interior which offer much more privacy. Because I have already used this option. Thanks for sharing this great informative article. I like the Office reference. 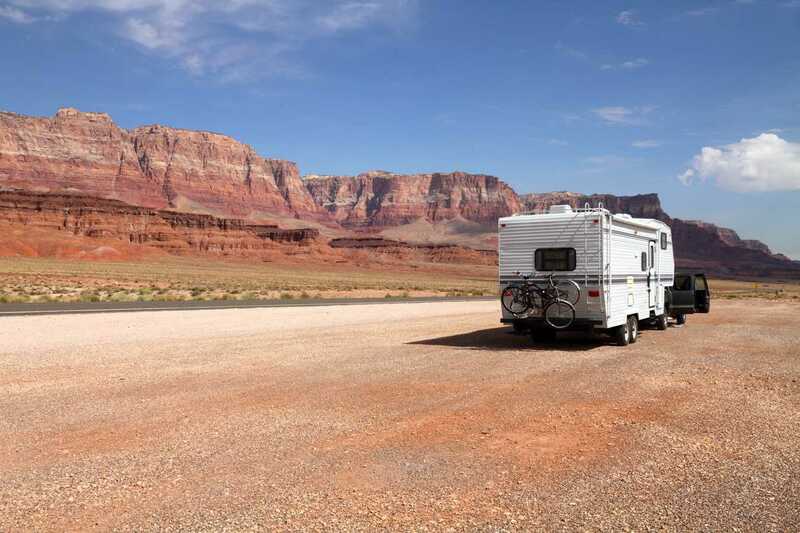 I learned a lot about travel trailers by reading this article. It was interesting to learn that travel trailers offer much more privacy than tent trailers. 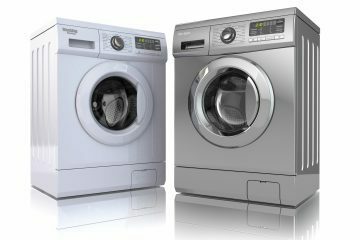 I hope this article can help us to avoid water damage to our camping goods in the future. I’m a 6-year pop-up camping vet who’s nearing a decision to upgrade to a travel trailer. For me, the biggest two issues are popping up (covered above) and the comfort of beds (not covered above). I hate having to pop up the roof, pull the beds out, lift up the kitchen to both pack and unpack the trailer. Yes, lots of stuff stays in the camper, but lots of the stuff (food, clothes) are temporary. It also prevents me from working on the trailer and cleaning it … my bed ends need to be vacuumed right now, but I don’t want to pop up and down. So, I’m sort of weary of the pop-up process. We have one of the larger models (Coleman/Fleetwood Utah) and it has a huge storage compartment up front, king-beds on each end, a slide-out dinette, and a couch that converts to a bed. We have slept 8 people (4 adults, 4 kids) + two 75-lb dogs inside fairly comfortably. Of course, it weighs 3,500 lbs, so V8 is recommended for towing. The slide-out makes all the difference. But, the “mattresses” on the end beds are just 4-6″ pieces of foam. After a few days, I’m not real comfortable, and I’m an average 175 lb guy. Some people use some memory foam and other bed toppers. I suppose I could do that, but haven’t. 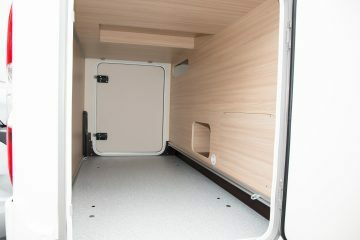 Beds in trailer tend to be build closer to the structure of our mattresses we use in our homes. I like that a lot better. One item that is worth considering in terms of set-up is leveling. It’s super easy to level a single-axle pop-up. I use what is called a BAL leveler, which basically just jacks up the low side wheel/tire. I will miss that aspect of the pop-up. I won’t miss the other aspects of set-up: pop up the top, pull out the bed ends, pull out the slide-out, fix all the “canvas” in place, set up all of the beds/bedding, and get all of the stowed away items out into more convenient locations. 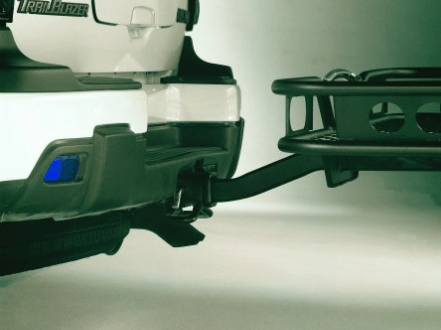 A travel trailer with a double axle will be much more difficult to level, but that’s about it. I will also state that the space issue is too variable to list as an advantage/disadvantage — surface space (flat surfaces to place items) is an issue, but overall space, storage, and sleeping space are not. I have a family of 6 and it’s actually quite hard to find smaller travel trailers that sleep that many people (2 abreast on the dinette does NOT count … only 1 fits there in the real world). My experience was that, without going with a 29’+ trailer, there weren’t many options out there. So, the Pop-Up was actually superior in space for us. I’ve lost 1 and soon to lose another … so the OP’s floorplan (bunks + dinette) easily sleeps 5 and fits my needs. Two years ago, it would have been too small. I’ll also expand on the privacy point above. Beyond toilets and more defined rooms in which to dress (e.g. ), there’s also the notion of audible privacy. Pop-ups are tent-like in terms of noise. If people walk by, you can hear their conversations like you’re standing there with them. If you want to take an afternoon nap, better bring some good earplugs. On the other hand, camping next to a river gives you that rushing water experience inside. Crickets chirping at night are easily heard inside. So, it goes both ways. But, I’m looking forward to a little more sound isolation … and I know my wife is! Obviously, trailer choice becomes a very personal decision. Some people must have a bathroom. We actually have a toilet in our pop-up and have not used it once. I thought a water heater and access to hot water was a must-have, so bought a pop-up with that option — we have used it 3 times and I haven’t put a drop of water in the tank in 4 years. I’ve been super-pleased with our pop-up and highly recommend the brand (even though defunct) and layout to anyone considering a pop-up. Bone-dry in some torrential downpours, accommodates our family, tons of sleeping capacity, plenty of storage, durable/problem-free, and not difficult (but not easy) to tow. But, I’m ready for the next thing. I love camping, and so I’m pretty sure that I’d really enjoy a tent trailer. Although I’m sure that it feels like camping, I think that it would feel a lot more secure as well. I mean, it wouldn’t be so easily tossed around or accessible by animals most likely, I think. 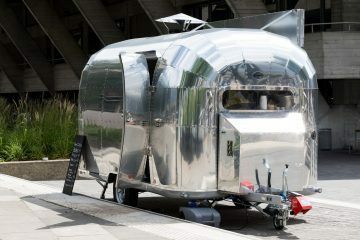 I have been searching for the brand of the hard side trailer pictured at the top of this article. Would you please give me the brand/model? Great tips–I love, love, love camping! Great article. Our family recently switched from a tent trailer to a camper trailer. A little reserved but think we will get used to it. I like how you mentioned that tent trailers feel more like camping. My husband and I want to get some sort of camper so we can take our family to spend time outdoors with ease. I really like the feel of actually camping, so maybe a tent trailer would be better for us. It’s great to know that travel trailers will ensure that anything and everyone inside it is dry. We’re planning to go off the grid for a while and are looking for a trailer. I’ll make sure that I buy a trailer that is waterproof so that I won’t have problems even if it rains and I’m in the middle of nowhere. My comment is more about the photograph at the top of the article. Would anyone know the identity of the conventional, hard-side trailer on the left with the pop-up roof? It looks like a Casita to me, usually sold in the West, not common in the East, but I have seen them on Ebay. I looked long and hard at both popups and hard sided trailers, and considering my vehicle, just bought another used popup trailer to replace my ancient 1991 popup trailer. The Problem: My Subaru Forester is rated at 2500 pounds’ towing capacity. Like most of us, I don’t want to buy a truck or SUV so I can haul something heavy. I just paid off my Forester last month. A tow rating of 2500 pounds doesn’t mean I can haul 2500 pounds. The rule of thumb is to go no more than 70% of towing capacity, and that is pushing it. My old popup weighed 1100 pounds; my new one weighs 1500 pounds, and I can feel the difference. I looked at lightweight hard-sided trailers, and those that weighed 1000 pounds or so presented some logistical problems. There are a bunch of Teardrops and other cute little ones that can fit a human body or two and not much else. Backpacking tents have more space. My friend has a 13-foot fiberglass camper, and it has some real advantages. He can pull off at a rest area and pop into it for the night. That’s been my dream. There are a couple of problems with the fiberglass campers. The first is supply and cost. The places that make them are all booked out a year; one-year-old models actually sell for more than a new one, because people can get one that way right away. Used ones hold their value, but that means that cheapos like me have to pay almost full price for them. These babies are durable and each brand has a cult following. If one comes up for sale, they are sold within days. I saw a project (meaning a mess) go for $4,400 and it was 30 years old. Most ancient ones sell in the $5,000 to $10,000 range, and who knows what repairs they need (although the fiberglass ones tend not to have leaking and dry rot problems. New ones go for $12,000 to $20,000. The 16-footers are too heavy for me to haul. The other problem with the 13-footers is that the box size is only 10 feet. For the most part, you have to have a table/bed and a kitchen, and that’s it. Some had a choice of a toilet or bunk beds at one end. But 10 feet doesn’t give you much room. This may seem weird, but I will disappear somewhere and work in my camper (or play by day and work at night) and like having both the bed and table accessible. So rather than buy a new SUV or a truck, I bought a used popup in very good condition for $2400. Other than a couple tiny repairs, it mostly needed some rustoleum. The advantage of the used popup is that they don’t hold their value. If you know what you’re looking for (no dryrot on the floor, no leaks in the roof, a perfectly working lift system [don’t try to fix the lift system] and a good canvas), you can get a used one for way less than full price that is in really good shape. The Upsides: Besides the low price … It’s 8′ long, so it’s easy to tow, and when opened, I get 16 feet of living space, not 10 feet. This gives me the table, stove, fridge , furnace, and two beds, plus the table converts if I have a trailer full. The second bed gives me lots of storage space once opened when I’m alone and room for others when I’m with friends or when my kids are home from college. You can get much longer and luxurious popups for a bit greater investment. Beds tend to be lousy in popups, and at times in hard sided campers, depending on price. I had a custom mattress made for $300 at a local mattress shop, and that makes me feel like I didn’t sleep on a board. The Downsides: These have been mentioned. You need to pop it up every time you move it, which wouldn’t be a big deal if I didn’t have to empty it each time I moved it. And it’s not very good for winter stuff (with the furnace, I’m good from April until Thanksgiving, even in Northern New England, where I live). You can try these in winter, but it’s a lot of work to keep the condensation down, as well as to keep them warm (but a furnace or catalytic space heater makes them comfortable at 20 or 30 degrees). However, this does allow me to get out of my home office, where I live and work. One more note: Although people mentioned that popups can be a problem in the rain, I’ve never had a problem , even in torrential downpours. The only problem is setting up in a torrential downpour, which I did once and regretted immensely. Wait until the rain stops, unless you live in a place where you get 300 inches of rain a year. Nope, not a Casita. Casitas don’t have a pop-up top. They are, however, great trailers. We’ve been using a very nice Jayco tent trailer for nearly a decade. Got it while we still had kids at home and it has been a pretty good deal. But as we get older and since the kids are all gone, we are seriously considering a hard-side trailer. Not because our pop-up is in need of replacement but because it gets harder for us to set up each time we go out. We aren’t OLD, but we are getting there and all the sliding and cranking and leveling and adjusting wears us out. By the time we are all set up all we want to do is go to bed. Another issue is that over the years there have been a number of adjustments (also called repairs) we have needed to make and the older it gets, the more they appear. And I recognize that ALL trailers (pop-up or hard side) will need repairs, but my experience with both shows the tent trailer seems to have more issues. The canvas is always susceptible to tears and sun rot and the main door eventually becomes obstinate and won’t go in all the way. And don’t get me started on velcro. It’s all over the trailer and over time it stops ‘velcroing’ like it should. Then there are the slide out beds that are uncomfortable unless you add generous amounts of padding. Plus, as the trailer ages, the platforms for the beds have a tendency to sag. Anyway, it looks like we will be ‘graduating’ to the ‘big-boy’ trailer (or maybe it’s regressing to the ‘feeble people’ option). Whatever it is, we have enjoyed the tent-trailer but are excited to enter the new world of camping. During a major windstorm, I saw a tent trailer fill with many people. Thought it to be a party at first, but the people were not acting like it. They were all pushing up on the roof to keep it from buckling.